In the recent days, I have received plenty of requests to review The Face Shop products (especially because it seems like they are everywhere!). Lets’ find out if they’re famous for the right reasons or not, shall we? I’m so glad The Faceshop has finally come to India! 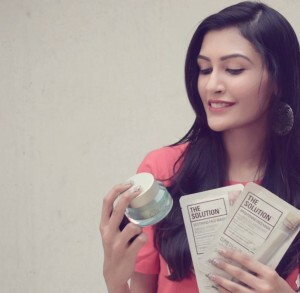 I recently got my hands on three of their products and I can’t wait to share everything about them: details, first impressions, and reviews! 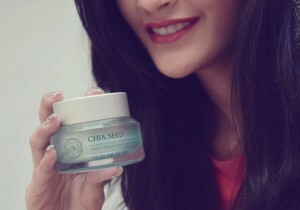 The three products are The Face Shop Chia Seed No Shine Intense Hydrating Cream, The Solution Brightening Face Mask and The Solution Soothing Face Mask. Let’s talk about these in detail! So let’s start with my absolute favorite of the 3 products! Packaging: Talking about the packaging, it comes in a very classy acrylic bottle/jar (lets’ call it a jar) and looks unbreakable (although no, I haven’t thrown it down and checked, haha). The box is green-grey in color, focusing on their USP that it is natural and is without 7 additives which is a big big pro! The cream also comes with a spatula, which makes the whole process hygienic. Here’s what I think: My first impression of the Chia Seed cream was that it was less of a cream and more of a gel. The texture feels very light on the skin, unlike what a cream feels like (heavier in comparison). And you can imagine why this is so important for my skin, I need to use light products because I have combination acne-prone skin which is tilted towards being oily and making my life miserable. So coming back to the product, it is a light, gel-like cream with a sweet scent. While I personally like the smell, a few might not which is okay because it fades away in a few minutes. So yes, this is perfect for oily as well as acne-prone skin besides just for dry skin tones. You need very little of the product, so I assume one of these jars will last for a minimum of 6 months if not more. The product is rather easy to blend and gets absorbed really quickly. It lasts on the skin for a good 3-4 hours after which re-application is needed. I think the only con for some of you could be that the price is a bit expensive for a moisturizer but as far as the product quality goes, I think the brand more than makes up for it! There’s nothing more priceless than good skin, remember that. After using toner, apply adequate amount on face softly. Can be used as a treatment essence right after washing face. Coming to the next product, I don’t think these need any introduction. The Face Shop’s masks are one of their bestsellers and almost everyone owns at least one these days. 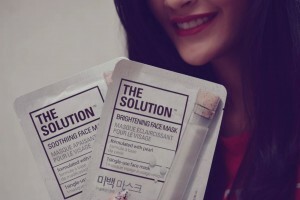 These Face masks help deal with specific problems and aim to give you better skin (or get rid of your concern problem/s) almost instantly or in a few hours. Personally, I have noticed that these masks work better for me when I apply them at night, the next mornings it feels like a complete transformation for my skin. If you have an event at night, however, you can definitely apply a mask a few hours prior for best results. Here’s what I think: This mask is very light and it definitely does what it claims. It hydrates and soothes your skin, irrespective of whether you have oily, dry or combination skin. I personally have combination acne-prone skin so I could see a visible difference the next morning. You pretty much wake up to baby skin and it lasts almost 2-3 days. I have also seen that my pores visibly reduced for those 2-3 days which is a great sign. If you’re a person who works a lot, stresses a lot or parties a lot – then this mask is a must-have in your regime. Someone has rightly said that your inner emotions tend to show up on your face. By using the mask, you can relieve yourself of some of that stress and sooth your skin. Although I don’t find Rs. 150 to be a very expensive price (if compared to some other brands), you can definitely make use of discount days or 1 + 1 free deals (which pop up sometimes, not always) to save some money and stock some masks for later. Here’s what I think: True to its claim, this mask definitely brightens your skin and gives you that much-deserved radiance your skin should have. But more than just brighten, it also hydrates your skin – pretty much works like a 2-in-1 mask. I am generally a victim of breakouts almost every day but this mask cleared my face to an extent (feels like magic to me, haha). The mask also gave a nice glow in the morning although I didn’t see much difference when I first took it off which means that you have to give it a few hours to work before you look for visible results. Once again, this feels soft and weightless on the skin and is great even for when you’re traveling or working long hours! I’ve become a fan of these products and am going to try some more out from the range. If I’d to pick favorites, I’d say it’d be the first and third products but I’d love to know your favorites in the comments too! Do also comment if you’d like a specific product review, I would love to review them for you. Also, The Face Shop products can be bought at Amazon India’s beauty shop. Don’t forget to like them on Facebook if you like their products! The review is our personal opinion and is honest. All pictures belong to us and cannot be used without our explicit permission.